Global NCAP has revealed a crash test result of five popular models sold in India - the Renault Kwid, Maruti Suzuki Celerio, Mahindra Scorpio and Hyundai Eon. All these cars scored low points for adult occupant protection when crashed at speeds of up to 64kmph which has created a serious safety concern. The Mahindra Scorpio scored a disappointing 0/5 in Adult Occupant Protection (AOP) and 2/5 in Child Occupant Protection (COP). GNCAP stated that for AOP, the protection offered to the driver head and chest was poor and the passengers' chest received marginal protection. 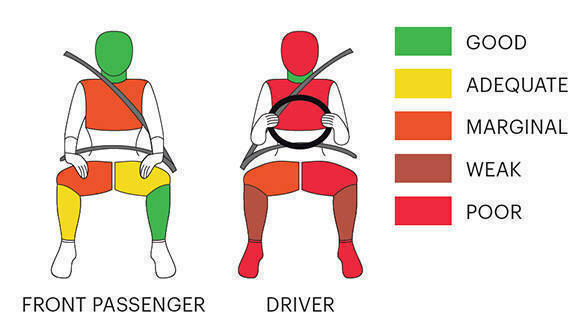 The passengers' knees could impact with dangerous structures in the dashboard. The body shell was rated as unstable and can not withstand further loadings. While for COP, the child seat for the three-year-old child was not able to prevent excessive forward movement during the impact, and the biomechanical readings were above the limits. The dynamic performance of the 18-month child restraint was adequate. However, the installation instructions on both child seats were insufficient and not permanently attached to the seat. Both CRS were compatible with the belt system on the vehicle. This vehicle was not equipped with a passenger airbag. 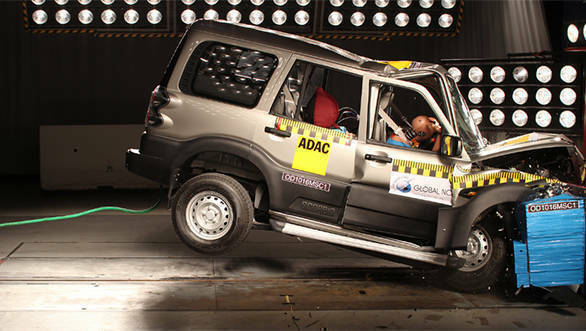 The crash test agency also commented, "Mahindra Scorpio scored zero star in the adult occupant protection and two stars in child occupant protection. The collapse of the structure combined with the lack of airbags explains the score for the adult occupants' protection which means that there is high probability of life threatening injuries for at least one of the adult passengers." From the image, it is clear that the S2 variant was used for the crash test. However, higher variants from S4+ onwards are offered with driver and side airbags as standard along with ABS and EBD. These variants might perform better in the crash test. All Mahindra Automotive products are developed and manufactured to meet or exceed the safety standards set in India for a safe driving experience. In fact, many models exceed the expected regulations of 2019. The star rating as released by Global NCAP (GNCAP) in the latest crash test was conducted on non-airbags variant of the Scorpio. Typically, in any star rating process, non-airbag variants do not perform well on safety standards. Most variants of the Scorpio are equipped with airbags and a safety package. Approximately 75% of Scorpio customers choose the air bags variants of the vehicle. There is nothing more important to us than our customer's safety. We are committed to meeting and exceeding all current and future safety norms and in most cases giving our customers choice of enhanced safety beyond the regulated standards.